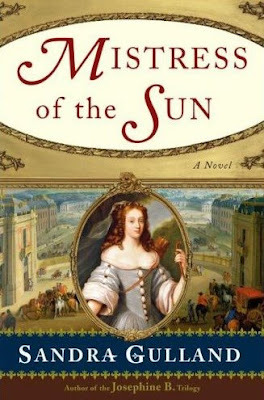 Mistress of the Sun by Sandra Gulland!! Giveaway ends on March 16th. Winner will be announced on March 17th. For 5 additional entries sign up as a follower; if you already are a follower you will automatically get this. For another additional one entry, post about this giveaway. Set against the magnificent decadence of the seventeenth-century French court, Mistress of the Sun begins when an eccentric young Louise falls in love with a wild white stallion and uses ancient magic to tame him. This one desperate action of her youth shadows her throughout her life, changing it in ways she could never imagine. Unmarriageable, and too poor to join a convent, Louise enters the court of the Sun King, where the king is captivated by her. As their love unfolds, Louise bears Louis four children, is made a duchess, and reigns unrivaled as his official mistress until dangerous intrigue threatens her position at court and in Louis's heart. A riveting love story with a captivating mystery at its heart, Mistress of the Sun illuminates both the power of true and perfect love and the rash actions we take to capture and tame it. Please include me in your giveaway. Thanks for offering such an interesting book! I'd love to win this, it looks fantastic. I follow your feed in my Google Reader. This has been on my Wish List for some time; it sounds very interesting. Please include me in the giveaway, and thanks. BTW, I follow your blog through Google Reader. This sounds like a great book..please enter me! Please put me down for this one! And I am off to go post about this!! So get me in there for an additional entry as well.. I want in on this. This book has been on my TBR pile for a while. Oh goodie, goodie, goodie! I'd love to enter. I've had this one on my wishlist for a while. Of course I'm a follower of your lovely blog and I'm going to post this in my sidebar. O please enter me! And I'm a follower :) Thanks! What an impressive and wonderful historical novel. Thanks for this great giveaway. Hi! I would like to enter this contest... Thanks! Please include me in your giveaway. This book has been on my TBR list for a long time. Thank you for offering this book. I would love to win this: and you know I already follow you!! Please add me to the list as well. Just signed up to follow you! My best friend would love this book; I'd love to win it for her. Thank you for offering this giveaway! eyeslikesugar [at] gmail [dot] com. I love historical fiction - please sign me up for this drawing. I also follow through FeedDemon. I'd love to be entered, this book sounds great! I follow you in Google Reader! Please enter me. Thanks. And I am a follower. I'd love to win this; your offer made me cave and follow you (I've been lurking around your blog for a while- it's awesome!). I loved Gulland's Josephine trilogy. Hi, I just joined as a follower. Please enter me in the drawing. Thanks! Sounds fantastic. I would like to be entered in the giveaway, too! Thanks. I love a good royal love story - please include me! Would love to be entered into your giveaway, thanks Amy. I'm already a fan & follower of your blog! I'm off to post about it on my blog, well I will tomorrow, it's time for bed now! I'd love to enter too. :) Your blog is saved as a "favorite" on my web browser. Please enter me..pretty, pretty please! And I'm already a follower. How could I not be? Thanks for the wonderful contest! I love books like this! Please enter me in your draw. Thanks. And I also am a subscriber. I would love to read this, historical novels are my favorites! I would love to be entered to win this! hey can I enter my name into the drawing, cannot wait to read this one, thanks for the chance! Oooh, LOVE Sandra Gulland! I have read all of her previous books, but not this one! Please enter me, Amy, and thanks for a great contest! Hello! I come to you through Miss Lucy! I would love to be entered for this drawing. Thank you! I am adding myself as a follower right now! Great site, great giveaway, and great book! Great giveaway! Please, take me away to another time and place! Thanks for the chance to win a copy of this book.
. . . and, I'm a follower! Sounds awesome! I'm already a follower! Looks like a great historical book! amy pls enter my name for it. also i am following you. gr8 book it seems! Sounds like a good book! Please enter me in the give-away. Thanks! Please enter me in the drawing. I just love historical fiction and this one looks particularly great. This sounds like something I would love! Thanks for the giveaway! I'm a follower, too. You have an awesome blog here! I am absolutely in love with seventeenth-century French court, it is my favorite time period. This sounds like a good book! Thanks for this chance to win it! Please sign me up. I have joined the followers of this blog. I'm back to let you know that I blogged about your contest here. I'd love to win this book! It sounds great! Enter me for this one please. It sounds brilliant and I love historical romances. Thanks! Historical fiction is one of my favorite genres - please count me in! Sounds absolutely great... Please count me in! Please include me. My birthday is March 17th, maybe it'll be a good omen! I love historical novels. Maybe I will have the Luck of the Irish on St. Patrick's day and win this giveaway. I've become a passionate reader of historical books - please enter me! I follow your feed in Bloglines. Thank you for letting me join the giveaway! Please include me! I just signed up as a follower. 82 entries! That's wonderful! I wish everyone could win. I just stumbled across this blog and I love it! I am now following and look forward to reading more-- gotta love historical fiction fans.